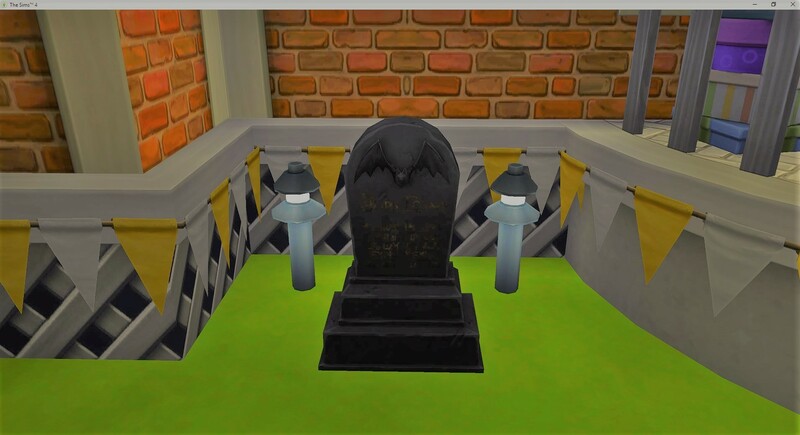 When I was looking in the family inventory for the gold medal date rewards, I also found Layne’s gravestone. I never expected it to be there so I never looked. He wasn’t a member of the family so I have no idea why it is there. 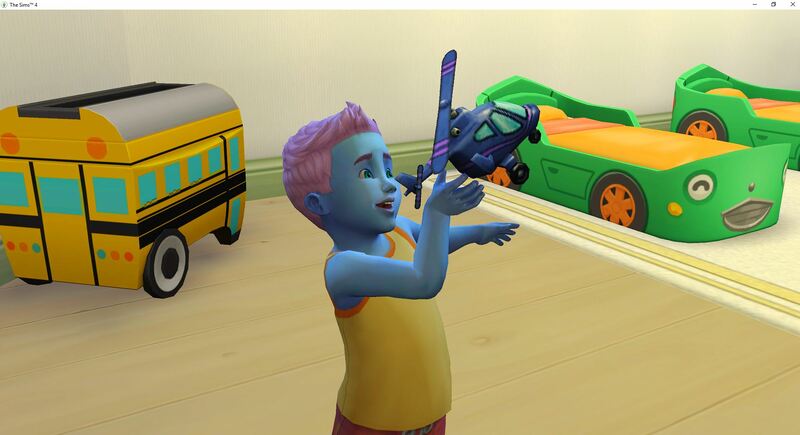 And, apparently I haven’t been in the family inventory since WinterFest (it is now the end of Spring). But, I am not going to complain. 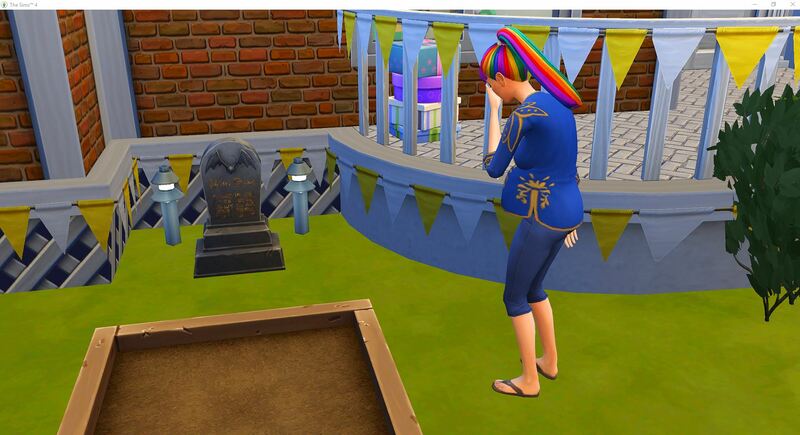 Layne’s grave has been placed and now Yuma waits to see if he will come out to visit. It is time for another makeover. Yuma has had 21 babies, so it is time for another hair change. 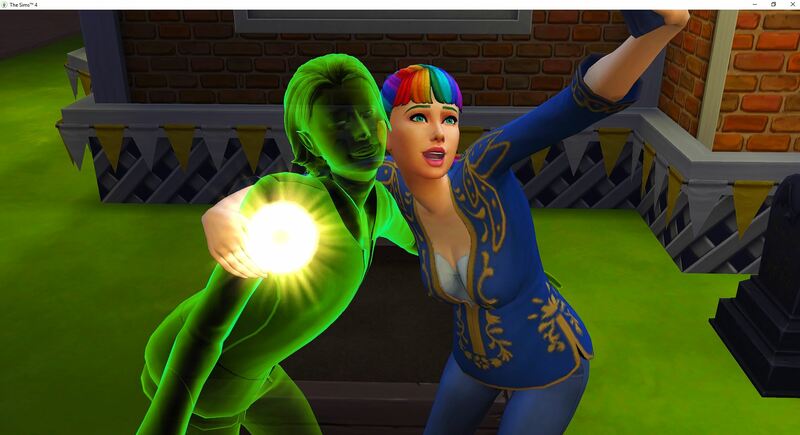 This is one of the new hairs from Get Famous – a rainbow hair in appearance on a green base. Yuma is close enough to the end of the challenge that this might be her last makeover. 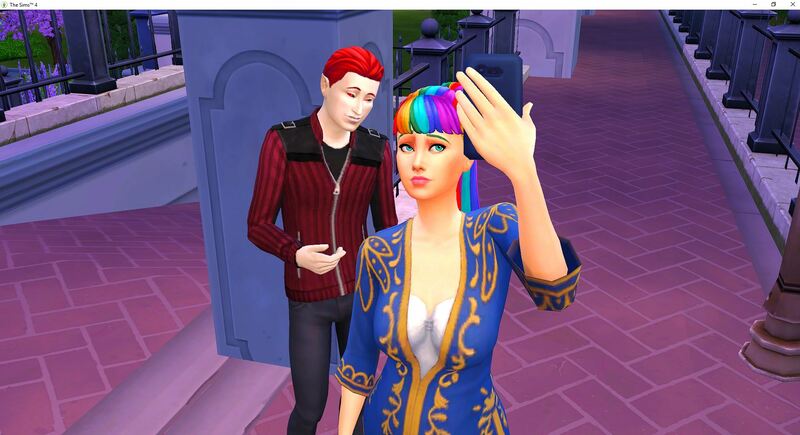 I left her clothes, just changed her hair this time. Halley got to keep basically everything, I just fixed her makeup. 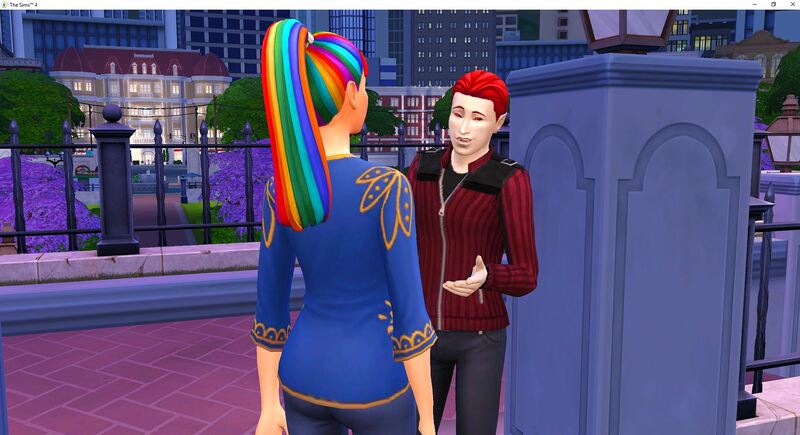 After her makeover, Yuma goes out to strengthen Layne’s connection to the sim-world. He needs to start coming to visit. Then she mourns what could have been. This encourages him to pop out for a visit. I am surprised he came out immediately but I think the EA/MCCC/Gods are taking pity on Yuma. Their relationship is still full strength so they pick right up where they left off. They become best friends once again but that also means Yuma is no longer best friends with Clyde. 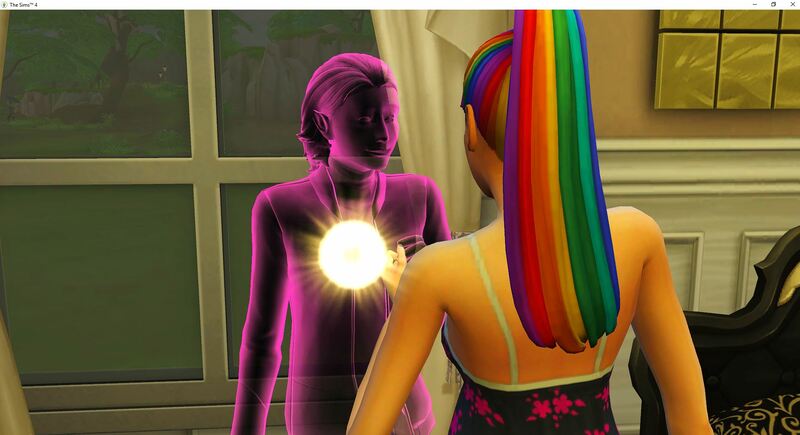 I might have to change that in MCCC because I think they should be able to have more than one best friend. Pictures to celebrate or it didn’t happen. 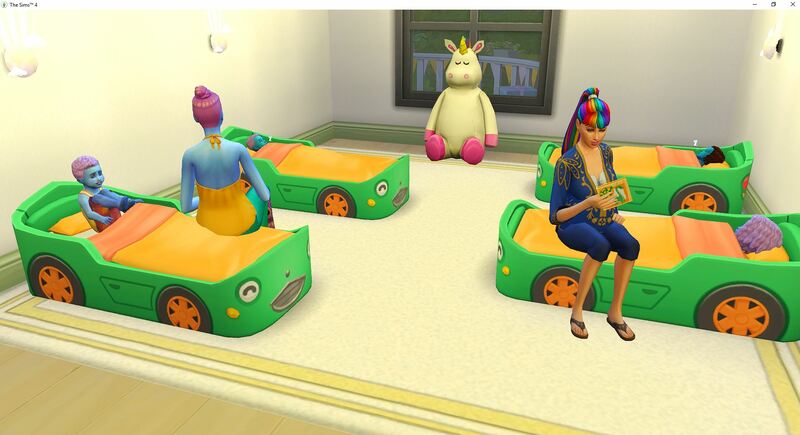 Then they move the festivities into the bedroom because Yuma can’t celebrate in the hot tub while she is pregnant. 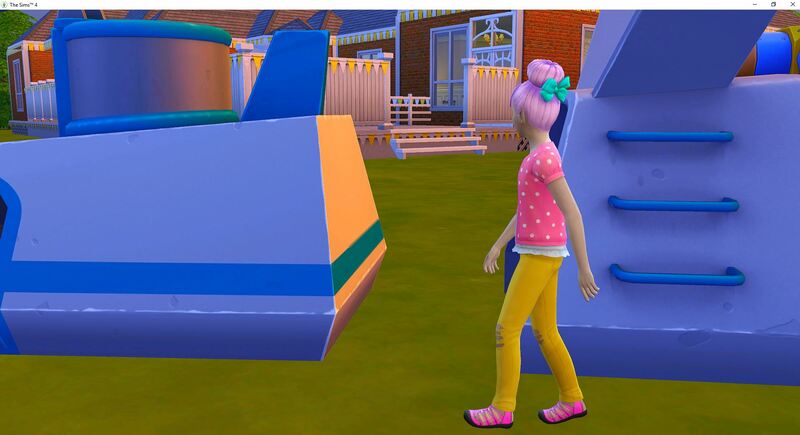 That is why I wanted the tent but I can’t keep the kids out of it, and there isn’t room for a closet in this house. 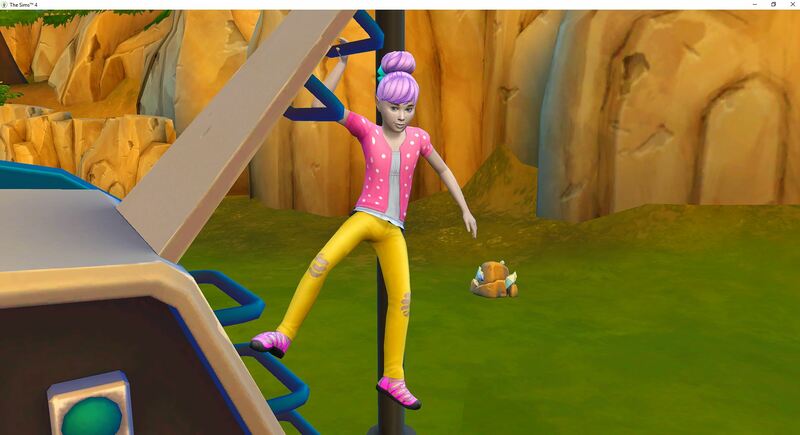 Sometimes, no matter how hard you try to avoid it, you still end up doing the same things your mother did. Yuma never planned on having a ghostly lover but here she is, sleeping next to him. Later that night, or early the next morning depending on how you look at it, Clyde calls for his regular date. Oh yeah, Clyde has been calling every night to ask Yuma out and she goes every once in awhile. This time Yuma accepts because they need to talk. Yuma still has a romantic relationship with Clyde – she never just-friended him because they get along well. 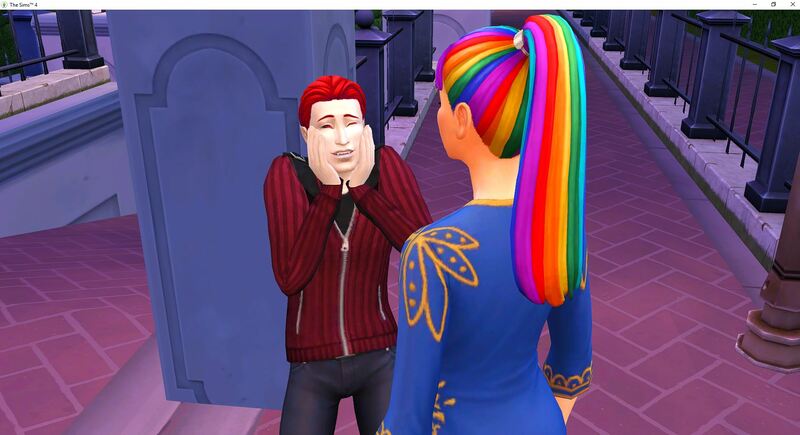 Clyde loves Yuma’s hair – this is his reaction to seeing her so I am going with he is reacting to her hair change. 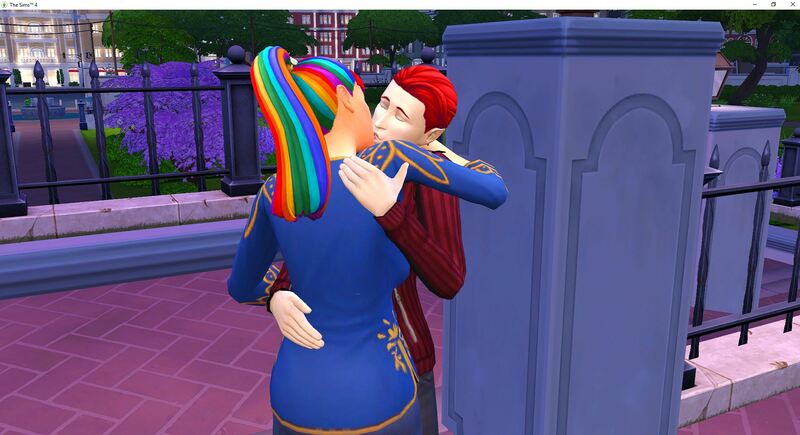 He immediately kisses her and she kisses him right back. 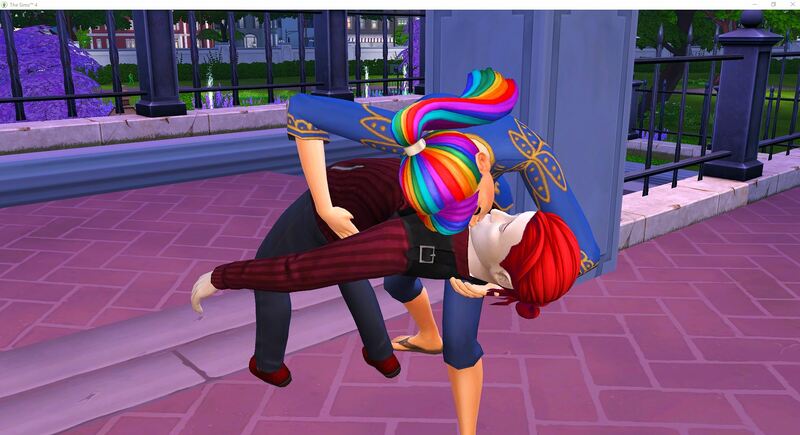 Their relationship is also fully maxed out. Yuma doesn’t break up with him, instead they talk and kiss and have a really great date. 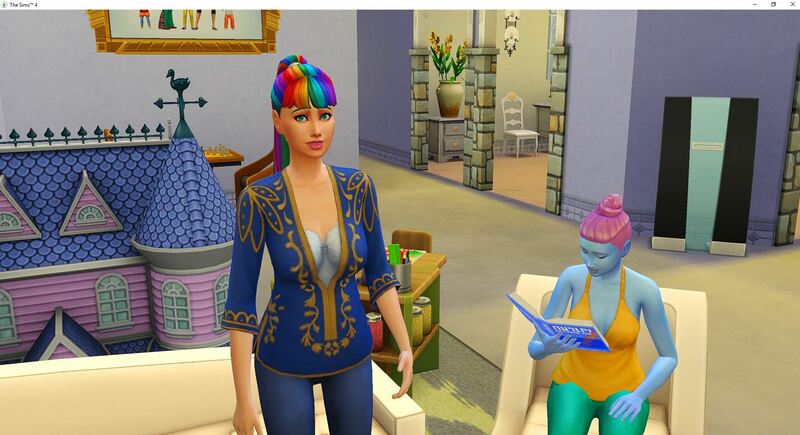 Yuma does a simstagram update – 12 new followers, well 12 total followers. Then, with the sun coming up, she kisses him goodbye and ends the date. She doesn’t break up with him because she loves them both – she can’t choose between them, not yet. 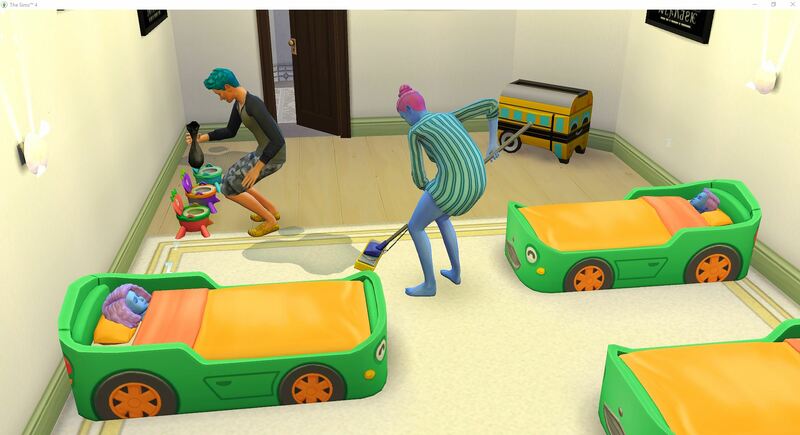 Back at the house, the toddlers are doing really productive things like watching each other. 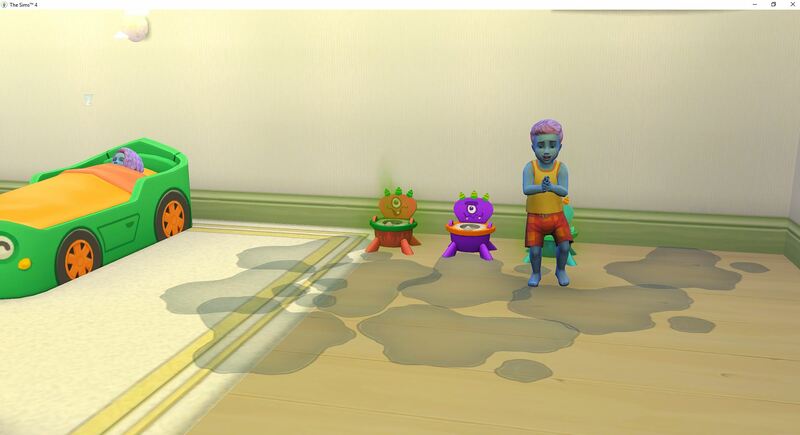 They are sent to play the hot potty game since their needs are all in the green. 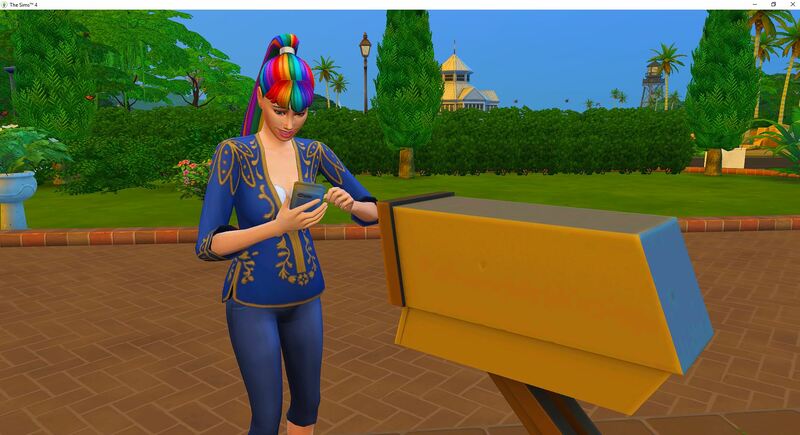 Yuma, checks her social media and then does another simstagram update. 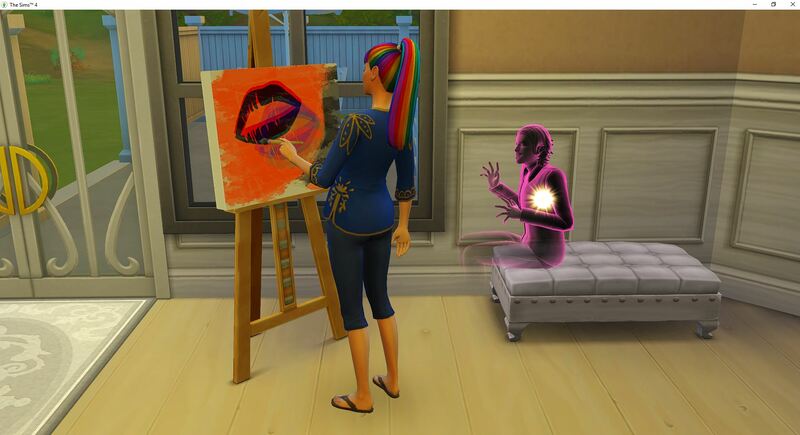 Then realizing she actually isn’t a celebrity anymore, she heads in to do some painting, leaving Halley to take care of Oberon and Portia for the day. Layne hangs around for most of the morning and even helps with the babies. As far as I can tell, he didn’t break anything, but he didn’t clean up anything either. 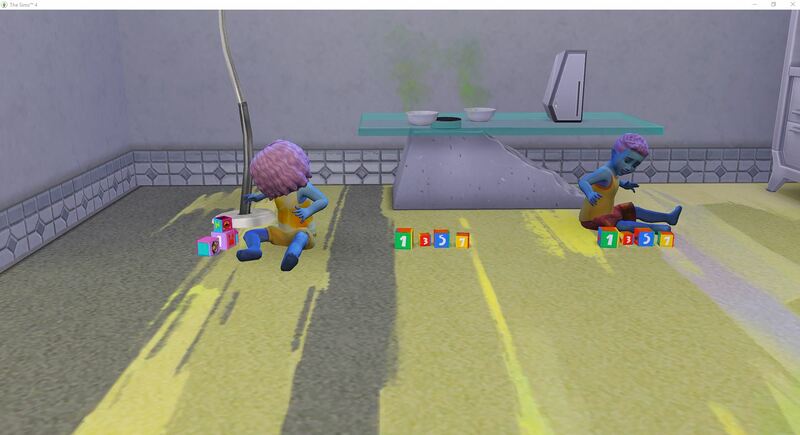 Mercury and Venus mastered their potty training but they left a mess for someone to clean up. I am glad it won’t be me. They were both sent to bed once they completed their training, but they will be waking up hungry. Tempest spent the day outside until her needs insisted she come back inside. 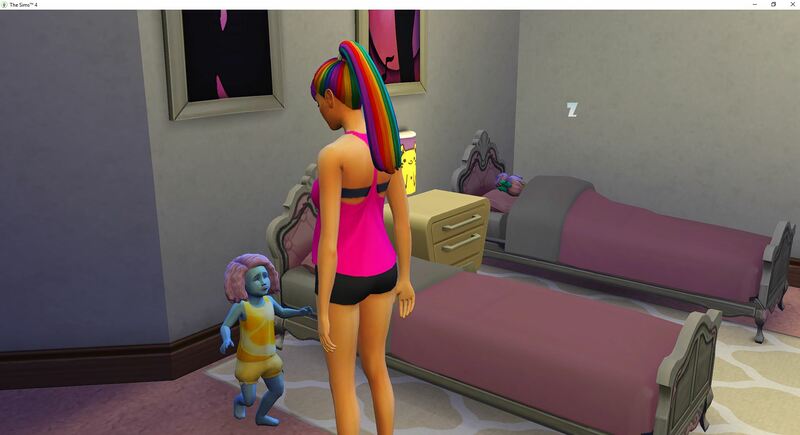 She was sent to bed for a nap after using the bathroom – actually everyone was sent to bed so the house was so quiet. Yuma spent the day painting. Layne sat and talked with her a little but when they just talk, they get negative points. 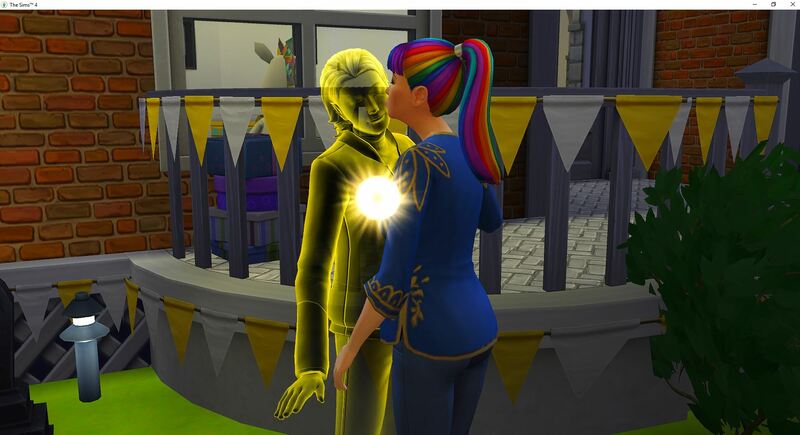 He has some vampire trait that affects their relationship apparently. I am watching them and I can’t tell if he is hissing when it happens. By mid afternoon Yuma is back to one-star celebrity and she has 3/5 masterpieces for Painter Extraordinaire. 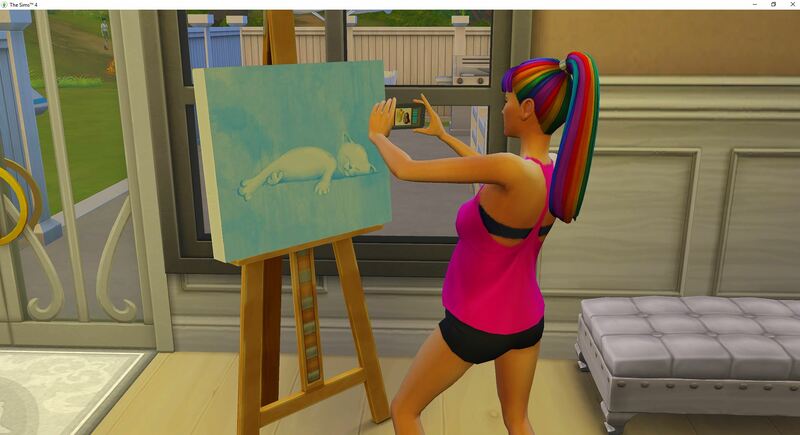 She posts to simstagram again for another 12 followers bringing her up to either 36 or 48 total. Angel asked if he could come over for a visit and Yuma said sure come on over. 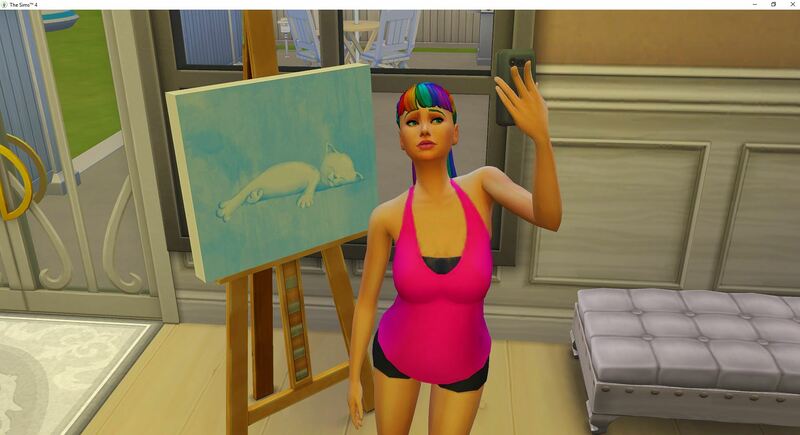 She kept on painting, while Angel helped Halley clean up the mess the toddlers made while potty training. 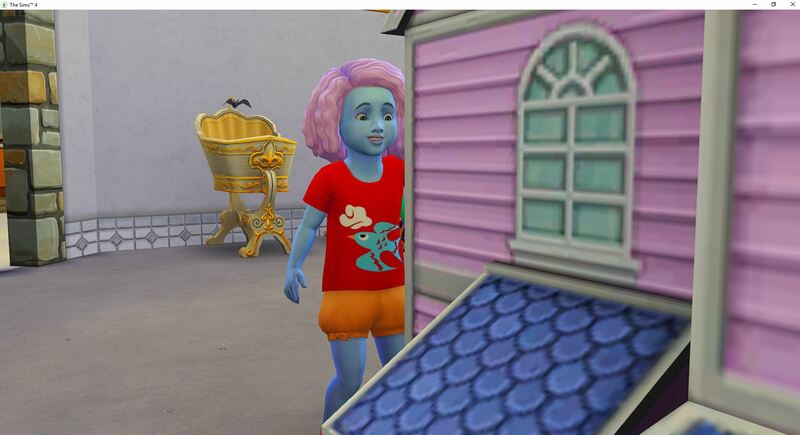 Yuma has completed Painter Extraordinaire, adding that to the list of aspirations completed. 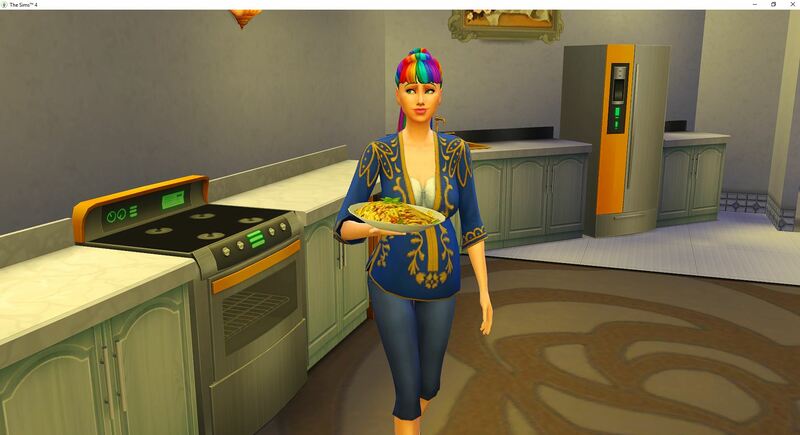 She purchases Free Services trait to add to her collection. 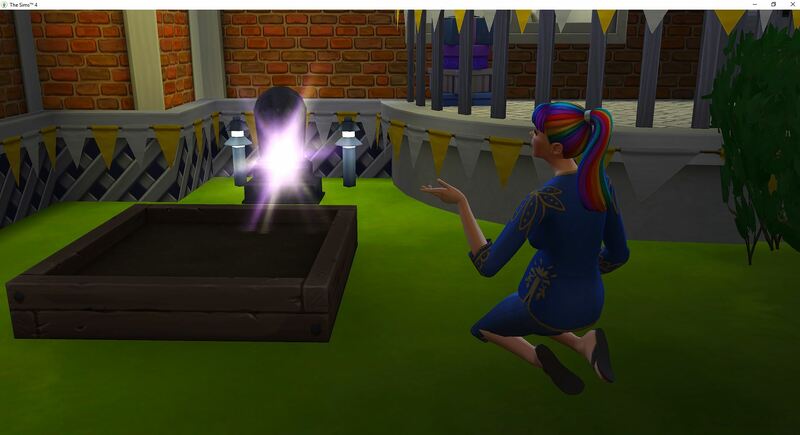 She posts an update to her simstagram for the fame and is up to 60 followers. As I check on everyone, I notice Venus is up and moving. She is headed down the hall for the only person still sleeping. Yuma heads her off and stops her from waking up Tempest. 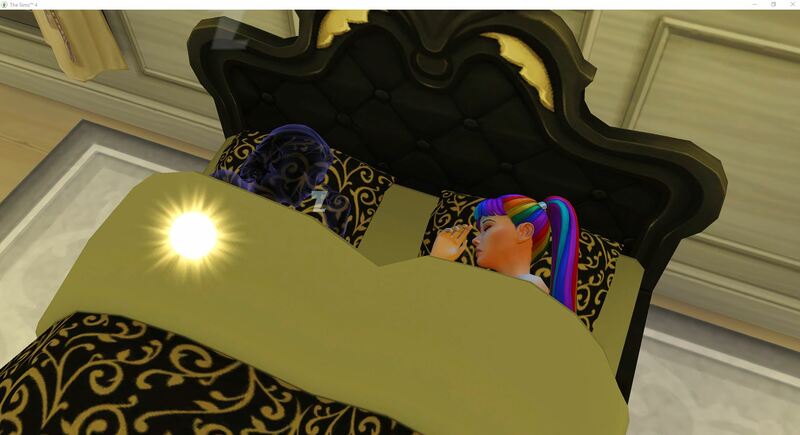 I am not sure why since Tempest needs to get up anyways. Yuma hugs away the sadness, gives her a bath, then everyone starts their day. It isn’t really starting their day since it is Saturday evening, but they get up and do stuff since no one is on a good schedule at the moment. I lose track of time on the weekends (their, mine, all weekends) and right now, they are nocturnal. It feels like morning since the toddlers and Tempest have been asleep all day. There is not a whole lot of free willy time any more. Everyone is set to tasks. Tempest is the closest in that she isn’t actually working on a specific skill, but she is just outside to stay out of trouble. The fact that she is building motor skill is just a bonus. 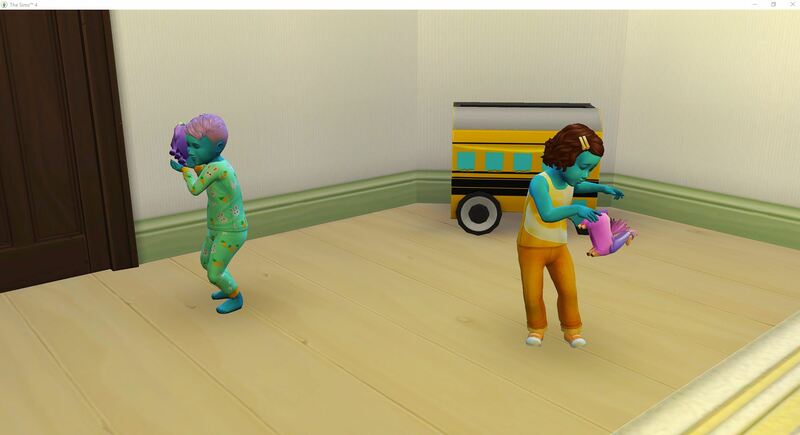 Yuma needs to throw some dance parties, but the toddlers have things to do that means the focus needs to stay here, so she will work on handiness for now. Do not stand anywhere close. Halley still has baby responsibility. Oberon and Portia don’t have their birthdays until Sunday, and that is coming up fast. 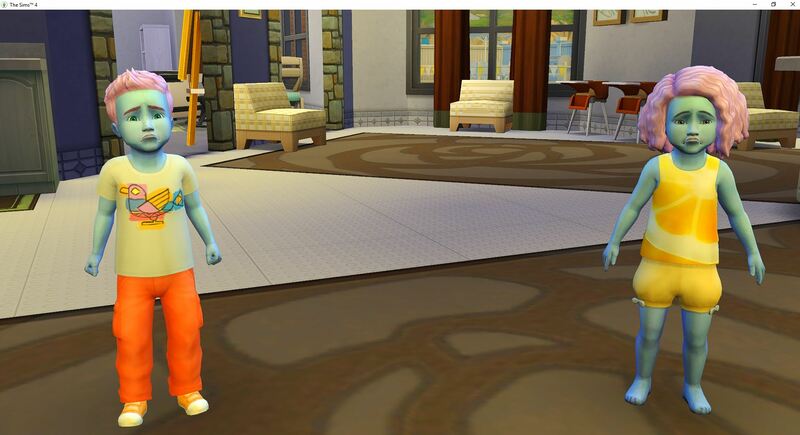 Mercury and Venus are not leveling their skills fast enough, so there will be four toddlers in the house soon. 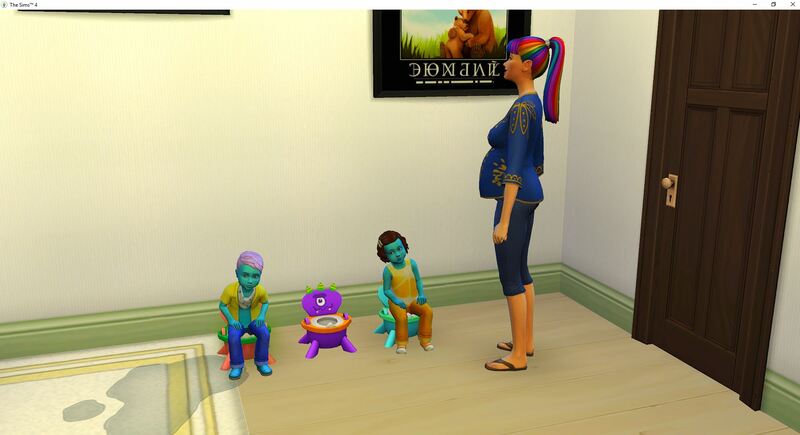 Mercury has reached level 3 on communication, imagination, and potty while Venus is only lacking thinking. When I said before that Yuma had fully upgraded the rocket, I was wrong. 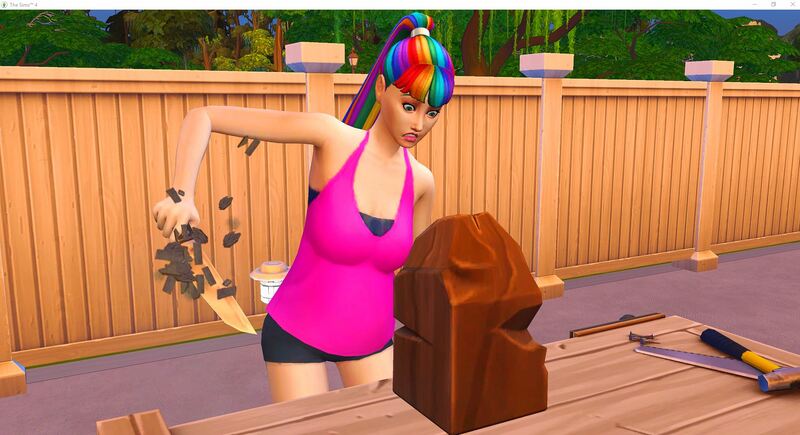 She still needed to finish the wormhole generator. I thought she was done, but I was wrong. She has been working on it when I remember, but now she is done. 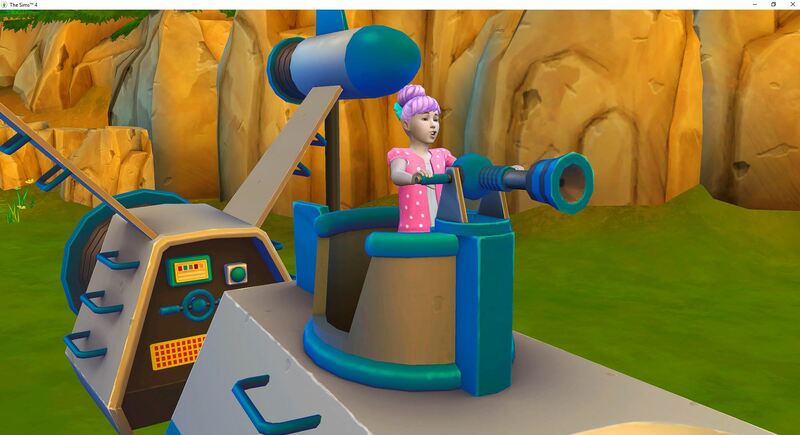 She has been upgrading her tub and the hot tub for the Nerd Brain aspiration and she finished the rocket upgrade also. Mercury finished up movement so he and Venus only have thinking remaining. Venus gets to Halley first and they work on flashcards for as long as Venus is willing. 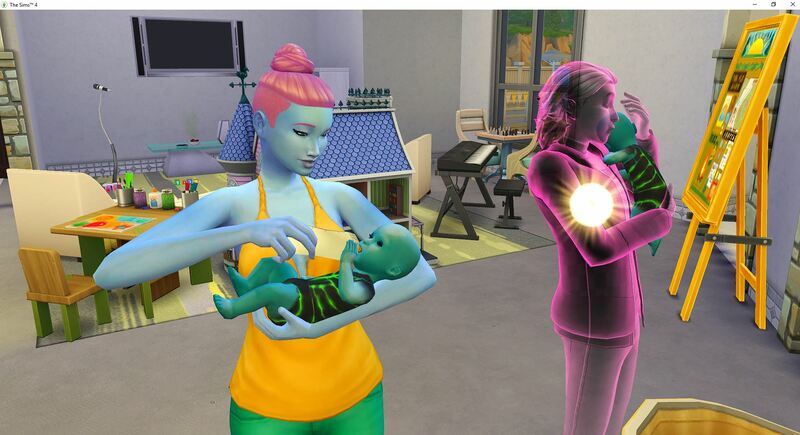 Talk about timing – Karson is the daddy of Oberon and Portia. Chaim is the daddy of Mercury and Venus. Yuma almost cut the timing too close on those two. 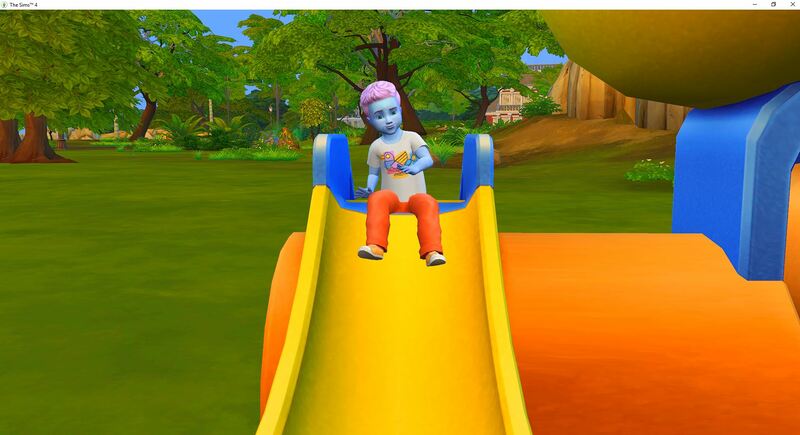 Henry is the baby daddy of the current pregnancy and he is the same age as Karson and Chaim so I wouldn’t be surprised to see his notification popup soon. 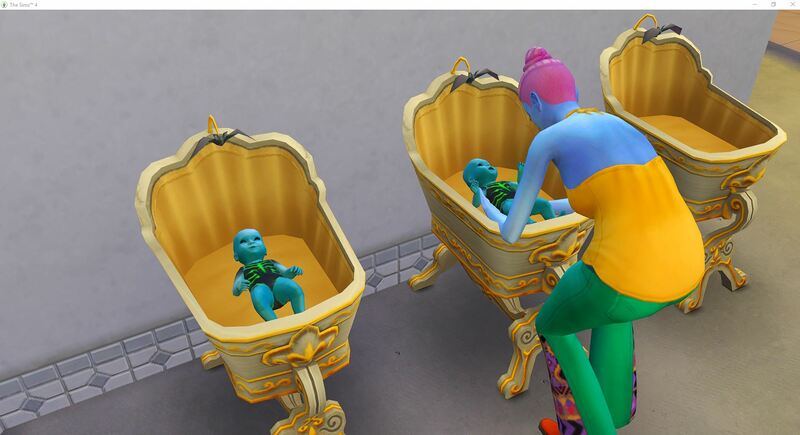 Sad babies because their daddy died. And they are hungry. 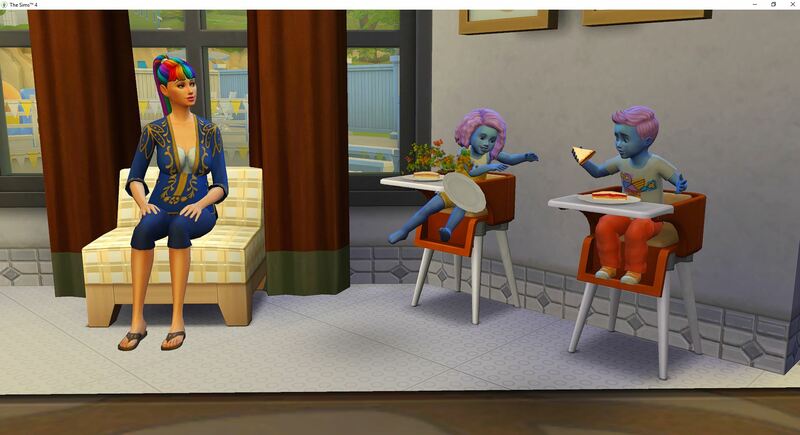 In order to prevent the high chair swapping, Yuma takes Mercury and Halley takes Venus and they both get sandwiches. 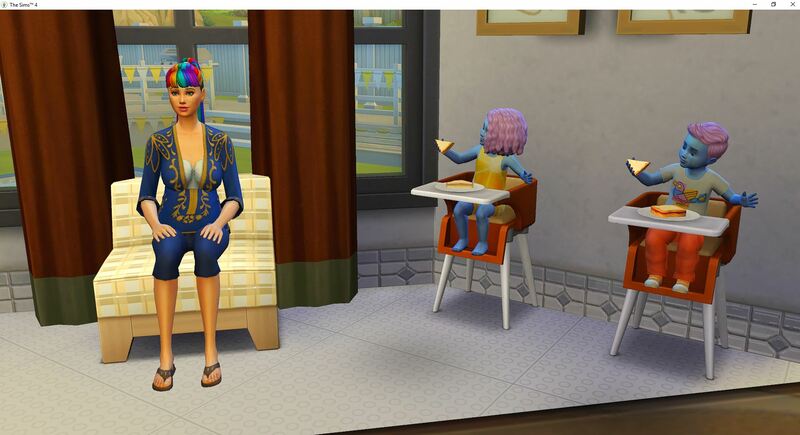 I added a mod by LittleMsSam so that when a toddler asks for food they actually get food and not animal crackers or snacks instead. Yuma hangs out because I am expecting one of them to throw their food on the floor. Yuma gets her quirk back – the emotion bomb. 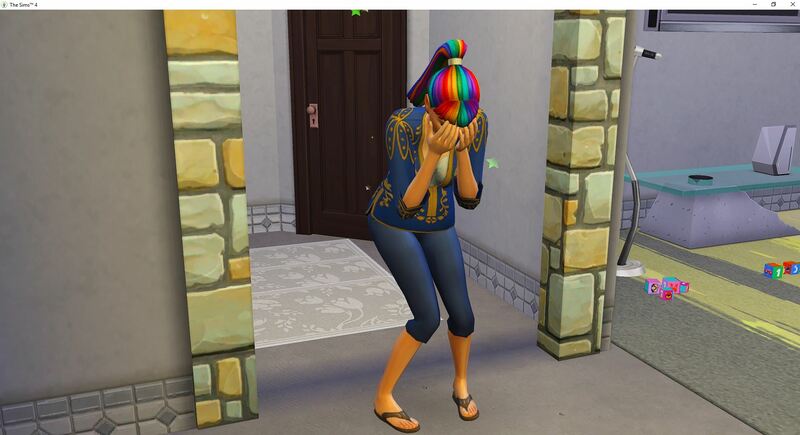 She has an emotional meltdown due to the overwhelming sadness from the deaths of Karson and Chaim. 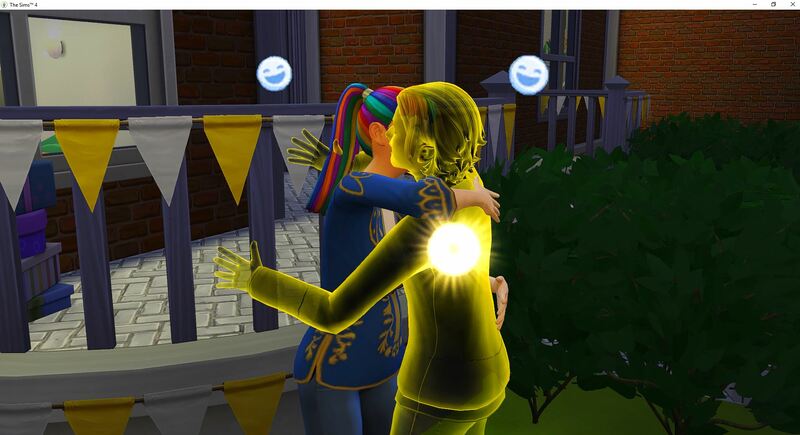 Portia definitely needs some help getting dressed because …nope… Yuma is going to finish hugging the sadness away first. 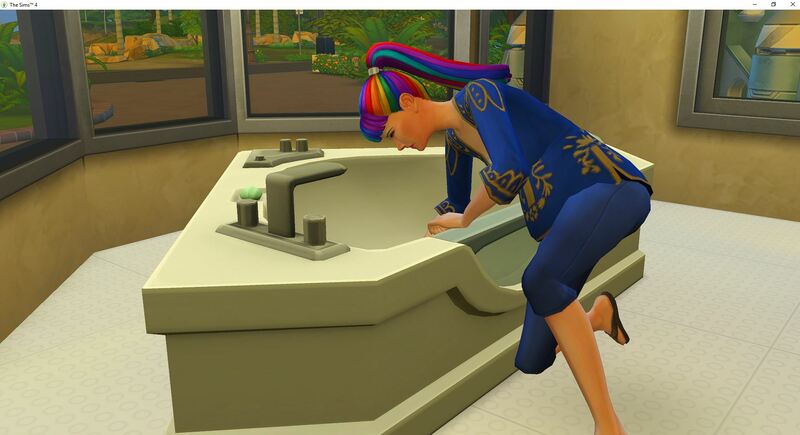 The potty training never ends. Oberon rolled Independent and Portia rolled Clingy. Oberon has a meltdown because he is starving. Notice the location of the food. Sunday evening and they are finally back on a normal schedule with everyone going to bed at bedtime. 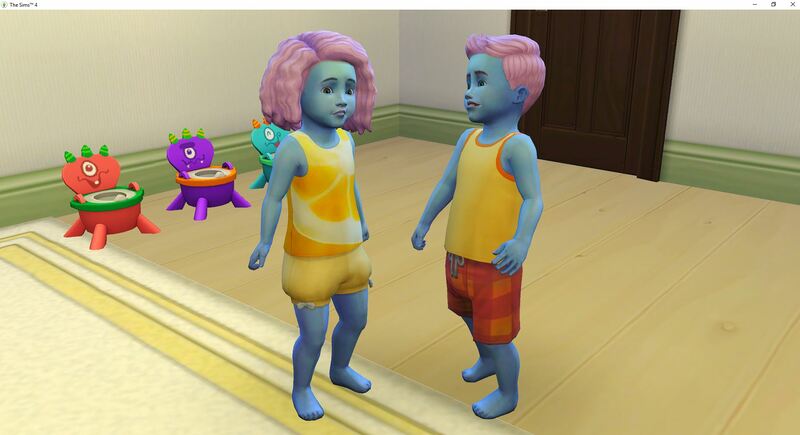 After getting all of the toddlers into bed Yuma and Halley have to chase down Mercury and Venus to put them back to bed a second time. But everyone is asleep by midnight. 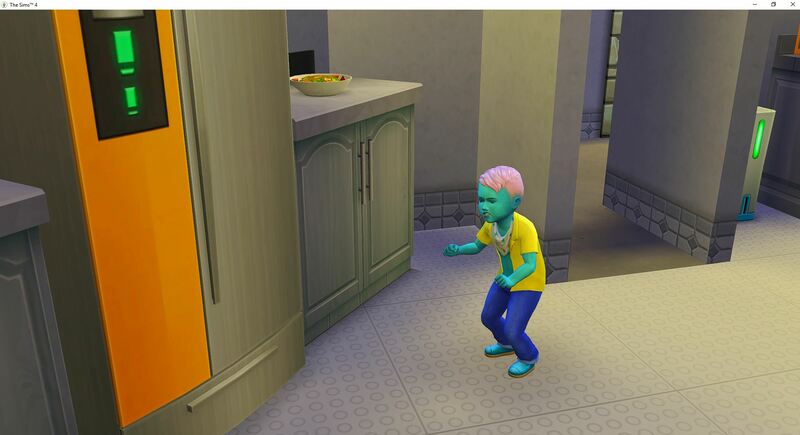 Yuma uses the rest of the night to stock the fridge. They ordered a pizza Sunday evening but it still hasn’t shown up and the option is stilled grayed out showing that it is on the way. 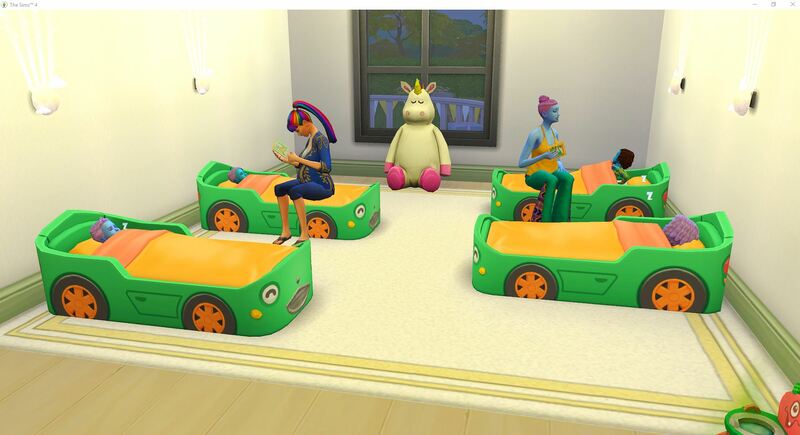 Monday starts early for the toddlers – 3am and they are back on the potty chairs. Mercury and Venus grab some chili for breakfast and then get down to business learning to think while Oberon and Portia start from scratch. Mercury and Venus work hard all morning on their blocks. Venus reaches level 3 and earns free willy time. She chooses to go back to bed. Mercury doesn’t reach level 3 but he follows Venus and goes back to bed. He still has a lot of learning left to do. Oberon and Portia are working on imagination. They have both reached level 3 in communication and that is it. 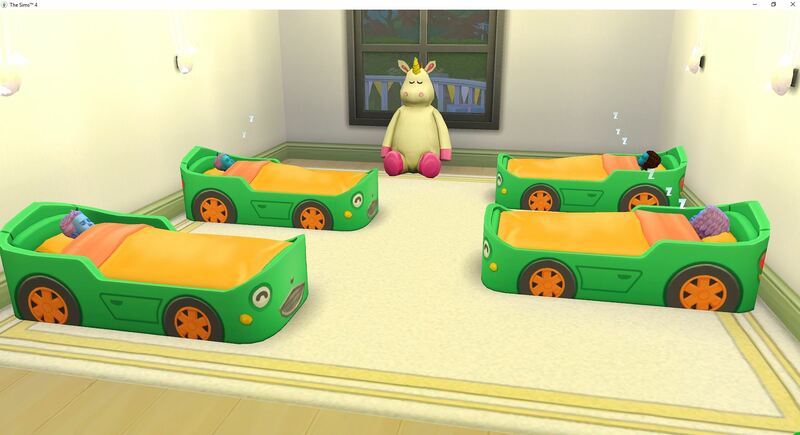 I realize they just became toddlers but it feels like they are going so slow. 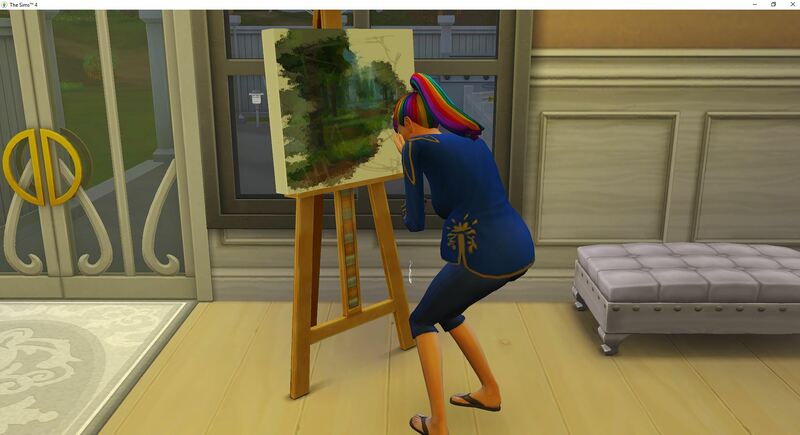 With the toddlers all sleeping, and Yuma not needing to sleep, she goes to paint. 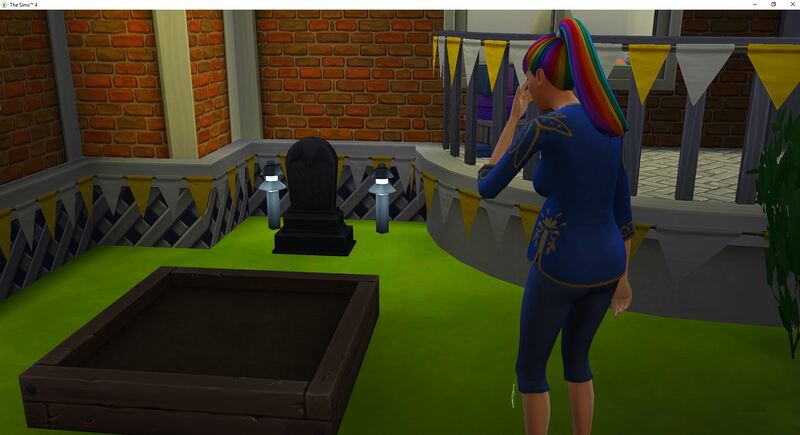 With a mourning moodlet still in her panel, it is time for an emotional meltdown to get rid of it. 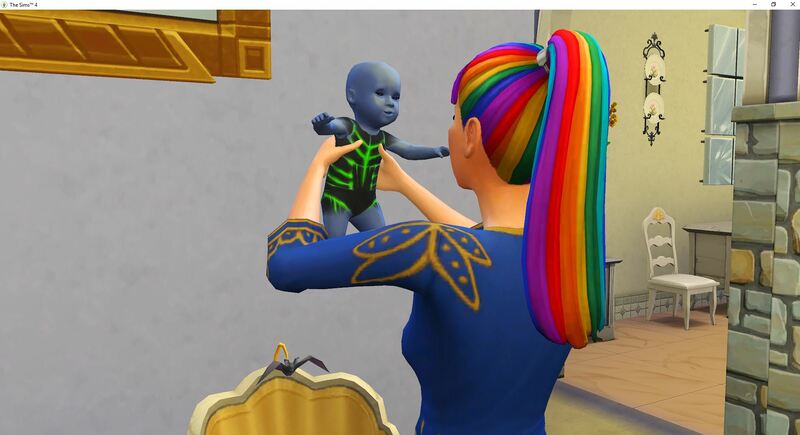 She still has not received notification about Henry, so he is holding on for the birth of his baby. 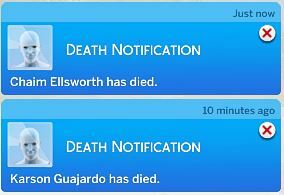 Nope, I take it back, Henry died also. She just didn’t get the notification. Layne has not been back to visit since that first night. It is definitely different from Wolfgang – he was out every night. I realize (now) that was just a couple of nights ago but it seems like it has been so long. School did not go well for the girls. 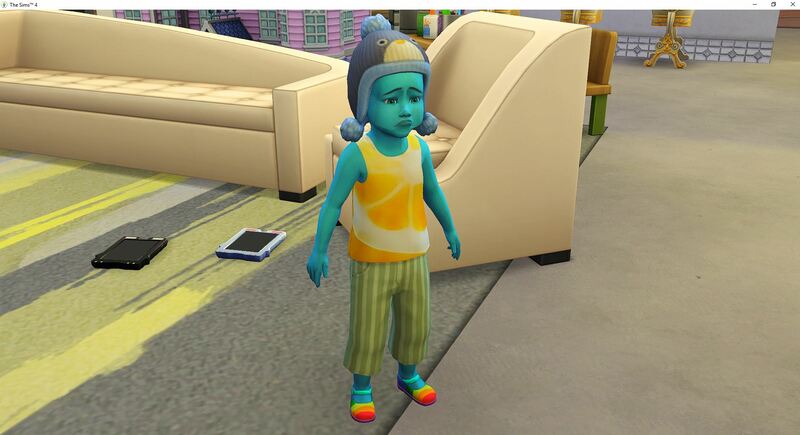 Even though Halley improved her grade to a “B”, she came home mortified from a mood swing. 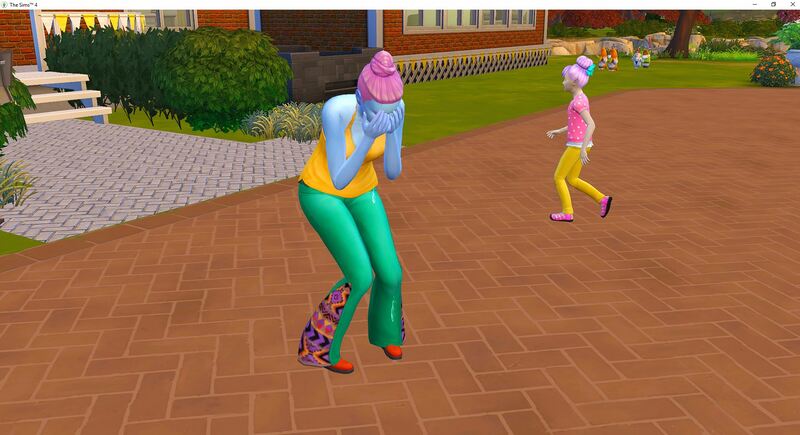 Tempest came home embarrassed from dropping a tray in the lunchroom. 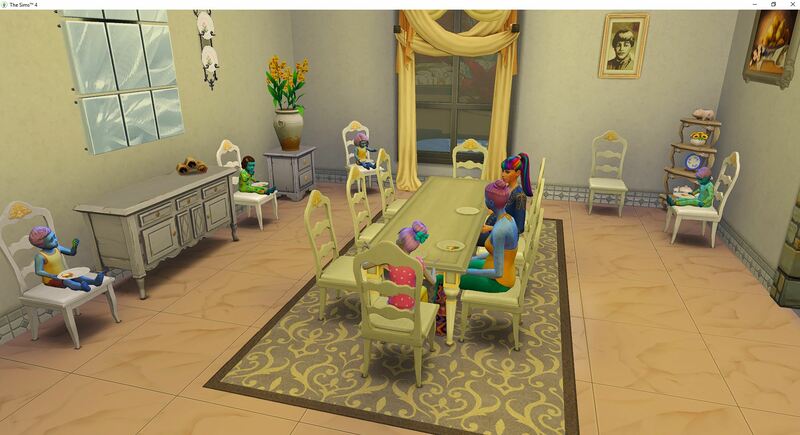 This is a rare occurrence, but they are all eating at the same time and not in the nursery. It was not pretty, but they are all in bed by 9:30pm. Just in time for Yuma to give birth. Challenge count is now 78/100 and Yuma is 4 days from her Adult birthday. 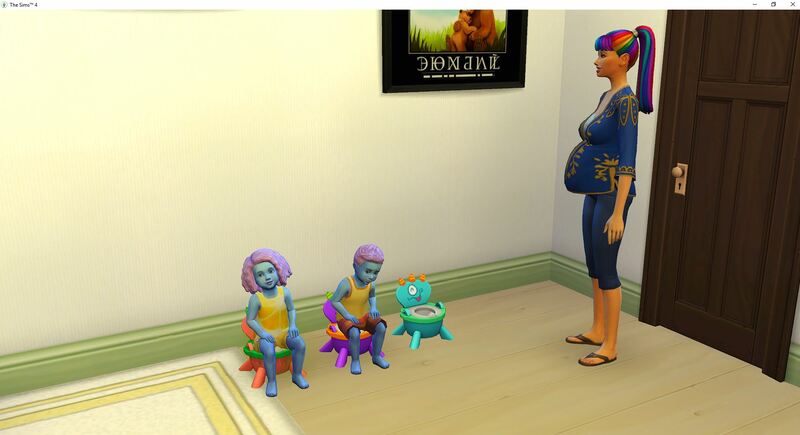 The house is full so she has to wait for Halley to move out – hopefully tomorrow, but it is possible for her to have one more pregnancy before her birthday.